From this site: "Flapping the ears can express excitement and joy. In turn, the beating of the ears on the skin can be heard. This sound causes other elephants to prick up their ears and to get in contact with the first elephant. In hot weather, elephants use their ears primarily to cool down." We suspect it was cooling down with temps well into 40C (90F) on the day we took this photo. This female kudu was comfortable eating carrots out of my hand. This evening we're having dinner guests only a few days prior to the two couples, Janet and Steve and Lynne and Mick, each takes off for their respective homes in the UK, staying for several months. We'll look forward to their return! In the interim, Kathy and Don are returning to Marloth Park in a week and we'll certainly enjoy spending time with them while they're staying at their lovely home in Marloth Park. 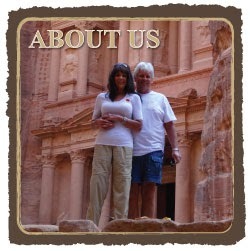 Linda and Ken will return in June or thereabouts and we look forward to seeing them soon. This is how it goes for many homeowners in Marloth Park, primarily based in other parts of the world, returning for one, two or three-month stints a few times a year. The first thing we look for when driving along the river is elephants. Many South Africans have homes in other parts of the country, also returning to Marloth as their part-time holiday home. Few rent homes, like us. Most own two or more homes, traveling back and forth between their various properties. That life never appealed to us. We've wanted to be free to travel to wherever we may choose, at any given time. Did we contemplate having a home here, considering how much we love it? Perhaps for one second. But then, the thought wafted away when we realize we're most fulfilled continuing on this path of life-on-the-move, one that works magically for who we are and who've we've become over these past years. Why change what's working so well and for which we're ultimately fulfilled and happy? In the interim, Louise informed us, if we'd like we can stay in this same house, named "Orange...More than Just a Colour" for our entire remaining year until we board a ship one year from today, March 24, 2019, leaving for the US for another family visit. We had a choice to stay in this house or move to another house. But, we like the house enough to stay another year, if Louise and the owners will have us. We've offered to move out for certain periods, if they find other renters willing to pay more. We can move on a dime! Louise assures us that's unlikely. How do we feel about staying in one property for such an extended period? Surprisingly, quite good. Many of the animals have already come to know us and will continue to do so as time marches on. The house is comfortable (we only use the main floor) and has literally everything we can possibly need. Could this be a courting male and female? Then, as we plan visits to other countries in Africa over this upcoming year, we'll have a place to leave our stuff, packing only what we'll need for the specific trip. This gives us peace of mind and makes these side trips considerably easier. This morning, up and at 'em early I started chopping and dicing for tonight's dinner party. Yesterday afternoon, I also did a little prep, making the remainder of today low key and easy. Entertaining in this lifestyle is very different from our former lives. I used to put so much pressure on myself, planning elaborate meals and setting an elaborate table, often for many guests. We often wonder about a lone elephant. Is it a male that has been ejected from the family who now has to make his own way in life, finding a mate, to later be off on his own once again. In this life, I plan easy homemade meals that don't require endless hours of standing in the kitchen. There's no need to make vast numbers of appetizers, side dishes, and desserts. No one here seems interested in desserts so I don't bake as I would have years ago. The best part is I don't feel bad about cooking less elaborate meals. I've changed so much over these past years, no longer striving to be the consummate hostess, finding simple delicious meals is ideal in the bush, whether made in a pot or on the braai (barbecue). The only thing I miss is linen napkins. The paper napkins sold in the area are small and flimsy. Nothing is nicer than a cloth napkin for guests. I guess I have to let that go. Waterbucks at the Crocodile River. Soon, we'll jump in the new little blue car and head to the local market to buy more paper napkins, bringing the camera with us as always, perhaps seeing "someone" special along the way. It's a good life here. There's absolutely nothing that has disappointed us during these past six weeks since our arrival. Often, when people "return" they're expectations are so high they cannot be fulfilled. For us, Marloth Park is more exciting than it was four years ago. Maybe we're wiser, more tolerant, and with fewer expectations after what we've learned during these past years. We don't fuss over the heat, the bugs and the days when few visitors stop by. Its all a part of living in the bush in this very special place, unlike any other, anywhere in the world. We're grateful. May your day find you feeling grateful and fulfilled. A rare moment of a blue sky with rainy cloudy skies day after day since we'd arrived in Fairlight almost two weeks earlier. For more Australia photos, please click here. It was four year ago today, on March 2, 2014, that we began posting this feature, "Photo from one year ago today."